If the devil is in the details, then he�fs probably frolicking happily in the linen choices that are out there for weddings and special events. With tables topped by everything from rolls of kraft paper (we do love some Maryland steamed crabs, after all) to custom dyed, hand sewn linens imported from India, there is really no end to the options for events from rustic to over-the-top, and at every price and formality level in between. To help you sort through the details and figure out how to get the look you want on enough tables to fit the guests you expect, we are going to take you through the calculations for today�fs hottest tablescapes, step-by-step. Many venues include some standard table options in their rental prices, so our first insider tip is to find out what types of tables are available at your venue. 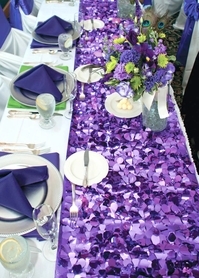 If your venue includes tables in your rental fee, you can save $$$ by using the ones that they provide. In general, round tables are widely available, and with good reason ~ they maximize seating for the space and offer plenty of options for tablescapes that fit almost any design inspiration. You can choose to use either square or round tablecloths on round tables. 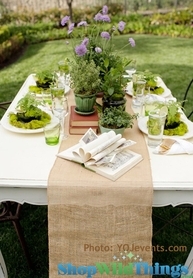 To find the size tablecloth that you need, multiply the desired drop by two, and then add the table diameter. The resulting number is the diameter/width of the tablecloth that you need. 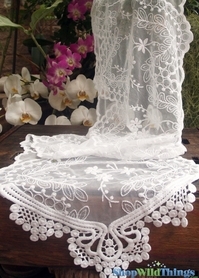 Desired drop is just the number of inches of tablecloth that you want to fall off the edges of the table. For weddings, most people choose to have the tablecloth drop all the way to the floor, or about 30�� on each side ~ or all the way around a round table. 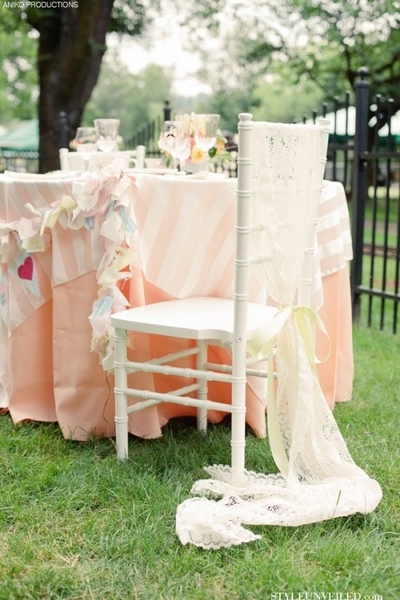 For tablecloths to graze the top of guests' laps, 10-12�� per side is about the right drop. On round tables, round tablecloths give an even edge around the bottom for an elegant, finished look. For a layered look like in the main photo, many people add a square table topper over a round tablecloth, often tying in two wedding colors. 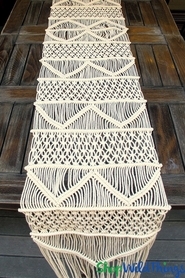 For this effect, the table topper can be anywhere from 10"-30+" longer than the table's diameter. The bigger the square topper, the smaller the amount of round tablecloth that will peek out from beneath the table topper. In the 2nd photo, we also love this original look ~ floral sheeting is the perfect tablecloth for a garden wedding, and it can be stapled together to cover virtually any table. A burlap table topper (3rd photo) is an easy and cost effective way to incorporate a vintage or rustic note into your tablescapes, often while using the standard tablecloths that come with your venue. You'll occasionally see rectangular tables set individually, but the rectangular table formation that dominates weddings right now is the *extremely* long rectangle (usually several long rectangular tables dressed as a single table). To calculate the right sized tablecloth to dress a single rectangle: Multiply the desired drop x 2 and add the table width to find the tablecloth width. Multiply the desired drop x 2 and add the table length to find the tablecloth length. For very long rectangular formations, the width calculation is the same. Often several tablecloths are used to get the required length. Often, brides choose to have tablecloths drop to the floor (about 30" on each side) for a formal look (especially if the tables are standard rentals with well loved legs, a full drop also hides any unsightly dents, etc.) 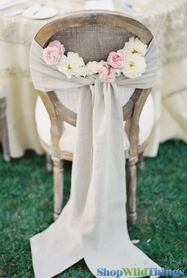 And we LOVE a monogrammed burlap runner like in the 4th photo. In the final photo, we also like a series of bare (beautiful wood) tables with just a burlap or jute runner. The only calculation needed here is how wide you want the runner (usually up to a third of the table width), and how far you want the runner to drop off the ends of the table(s). 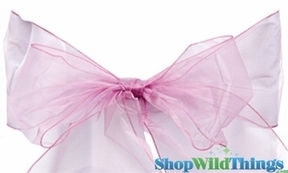 Shameless plug: These Adorable Curtain Tie Backs are begging to be used as pretty chair bows or embellishments. If you are the first to do it, please ~ pretty please ~ send us a picture? Our table topping options are fancy enough to fit into a chic soiree, with plenty of choices to lend a custom feel to your event, but we�fve searched out the best combinations of color, material, price, and quality so that we can offer superior table toppers, runners, and chair bows at prices that won�ft break the bank. If you have any questions about the sizes or shapes of tablecloths, table toppers, runners, or chair bows, feel free to call us. For a great website that goes much deeper into the specifics of table sizes and formations, check out this link.